Javier Hernández Balcázar was born 1 June 1988. He is a Mexican professional footballer who plays as a striker for English club West Ham United and the Mexico national team. 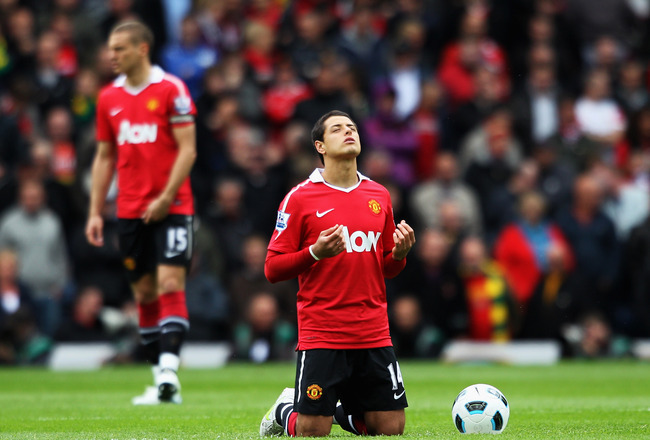 Hernández is commonly known by his nickname, Chicharito (Mexican Spanish: little pea), which he wears on his shirt. He began his career in 2006, playing for the Mexican club Guadalajara, before becoming the first Mexican player to join Manchester United in July 2010. A Mexican international, Hernández is his country's all-time leading goalscorer. He has represented Mexico at the 2010 FIFA World Cup, and he was the 2011 Gold Cup's top scorer with seven goals and was named the most valuable player of the tournament. Hernández was born in Guadalajara, Jalisco and first played in a recreation league when he was seven years old. Hernández' father, footballer Javier "Chícharo" Hernández, played for Monarcas Morelia. At the age of nine, Hernández joined C.D. Guadalajara and signed his first professional contract when he was 15. Hernández was also took business administration classes at Universidad del Valle de Atemajac. On 26 May 2012, Hernández became the Mexican ambassador for UNICEF. As ambassador, he participates in activities to encourage children and teenagers to not abandon their education. Hernández is a devout Roman Catholic. He is famous for his pre-game ritual where he gets on his knees and prays which he does before most games. SHARE this Amazing True Story to Inspire others to Praise God!